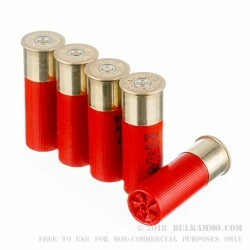 This 12 Gauge shotshell is loaded with 1 ⅛ ounces of #3 Xpert steel shot. Its hardness lets it deliver consistent patterns in addition to good penetration, and it is resistant to corrosion as well. The large .14” diameter pellets are perfect for ducks and geese, and can even take down a buck without too much trouble. This shot is safe to fire in areas where the law prohibits use of toxic ammunition. 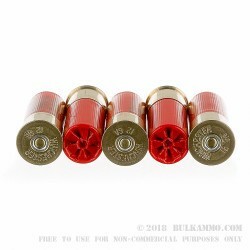 This shell offers a very high muzzle velocity of 1,400 fps. That will compensate nicely for steel’s relatively lower momentum than lead’s, and gives you an increased range -- a huge advantage to have while you’re taking down fast flying fowl. 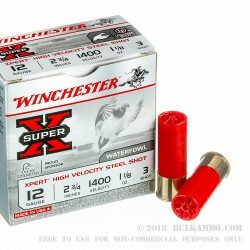 Winchester’s Super-X line of ammunition has provided exceptional quality and outstanding performance to all types of hunters and shooters since its introduction in 1922. 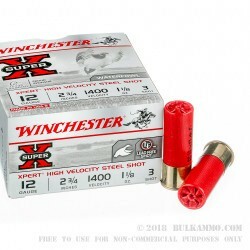 The brand perfectly complements Winchester’s already stellar reputation for making high quality ammunition.